Have you (yes, you male human being!) 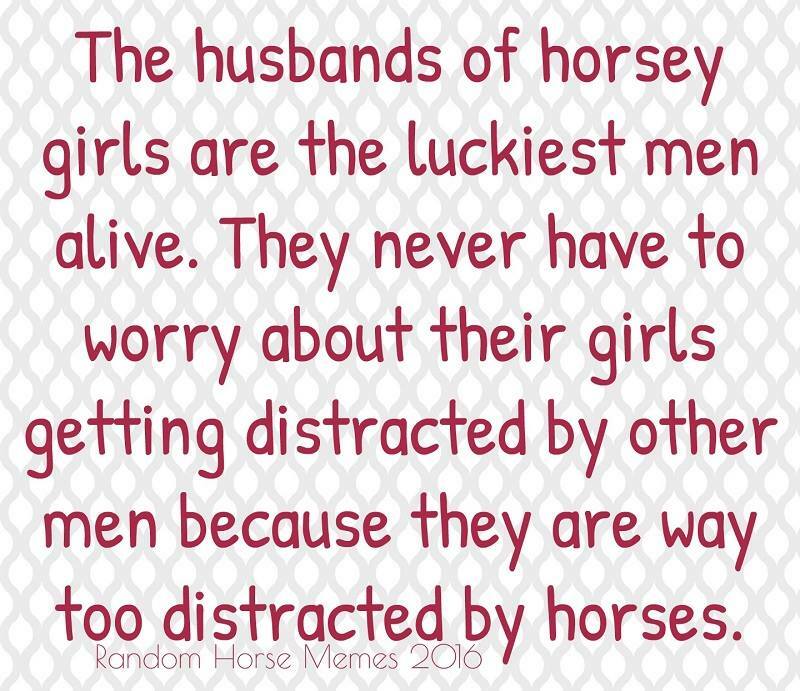 ever heard them say: beware of the horse girl? Yes?! Let me prove them wrong. 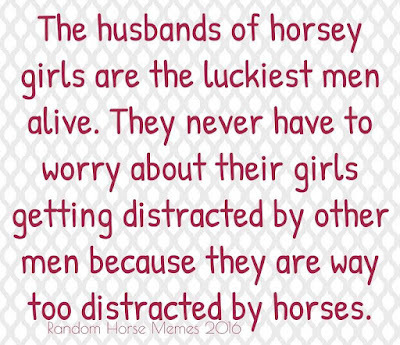 In other words: why horsey girlfriends rock! 1. One of the best things: you do not have to care about weekends or holidays. You do not have to plan anything, you do not have to find fancy locations for day trips. Actually, there are no holidays and weekends. At least, no holidays and weekends that are reserved for the two of you but for the three of you! In other words: you will be at the barn, mucking stables, grooming her horse, helping her at a show or traveling with her to watch a show. 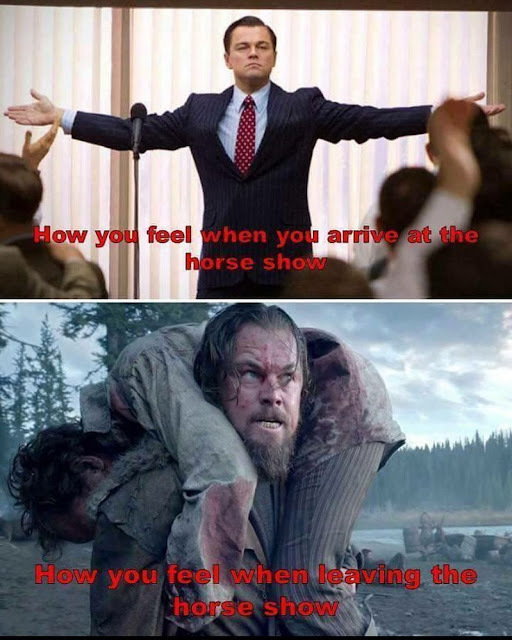 Thank God, there are plenty of other horse related events like trade fairs all year round meaning the likelihood to NOT have a horsey weekend converges to zero. ZERO! 2. Lucky you! 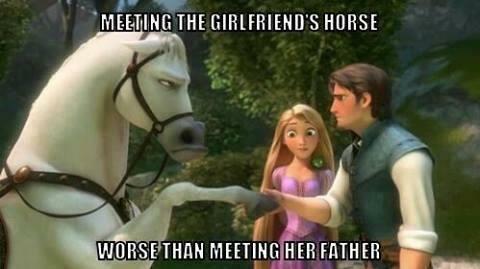 Your horsey girlfriend will never have eyes for another man. Only for her horse. And in the end, you will be the only jealous one. 3. Have you ever had problems with prioritization? You won't have issues anymore! 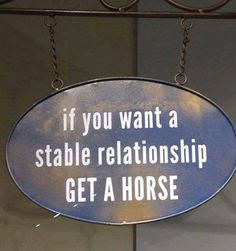 Horse girl rule number 1: horses come first. 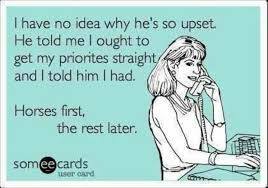 That is the one and only rule making priorities pretty clear. 4. Need somebody to fix a craftman's problem at home? You are not familiar with screwdrivers and hammer and nails? You will soon realize: you are now with somebody who can do it all. The only drawback: she will refuse to use her super powers at home - but when the fence needs fixing or the horse waterer spills over, she will be your man! 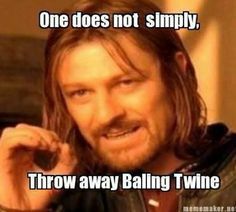 Bailing twine...Macgyver could not do it better! 5. There will never be awkward silence because she has always something to tell you. Actually, it will always be something about her horse. About how he looked at her today, about how much she loves him and how much he loves her. How good her ride was, how good he cantered, that he spooked at a plastic bag but that she still loves him, that she fed him, groomed him, that he had a little ouchie, that the farrier told her what a good boy he was (a fact that should never ever surprise you as her horse is the best, the most beautiful, the best behaved, most gorgeous living being that this earth has ever EVER seen!). Do not make the mistake and EVER tell her that it was her horse's fault that she fell off, that it was HIM stepping on her foot, that he is NOT the most beautiful horse on this planet. And make sure you LISTEN to her even though you have no idea why sitting trot is more difficult than posting trot and how the right lead is different to the wrong lead. 7. Have you ever worried to meet her parents? That they might not like you? Worry no more! 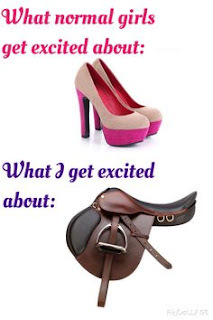 With an equestrian girlfriend, it simply does not matter whether they like you or not. 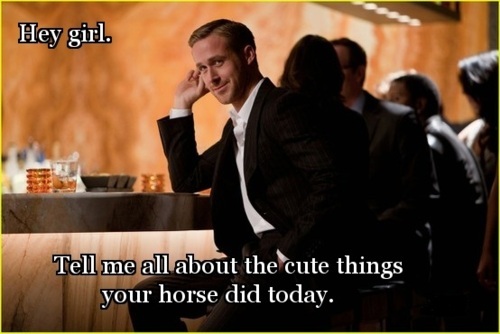 The only thing that matters is that her horse likes you. 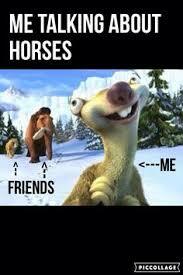 No further explanation needed that you HAVE to like her horse whether he likes you or not. 8. Have you ever felt guilty because of your collection of video games? You will soon realize that her collection of boots, saddle pads and blankets outnumbers your collection by far - let alone all the money she put in and will put in in the future. 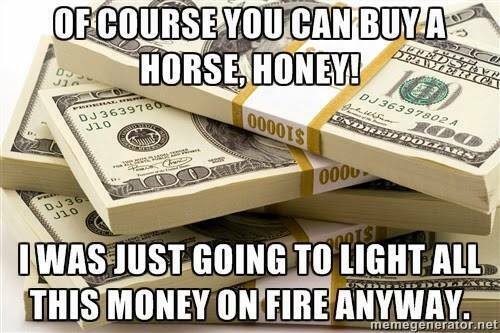 Good thing: there will always something that you can buy her as a present - which actually will be something for her horse. 9. You are very proud of your car and hardly ever somebody else is allowed to drive it? Good news! 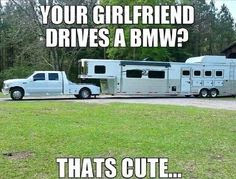 As long as it cannot haul a horse trailer, your horsey girlfriend will probably never ever touch it. Or look at it. Or admire it as you do. She will simply not be impressed. No chance! 10. Horsey girls are easy going and do not spend hours in the bathroom to put on makeup, fancy dresses, jewelry and high heels. 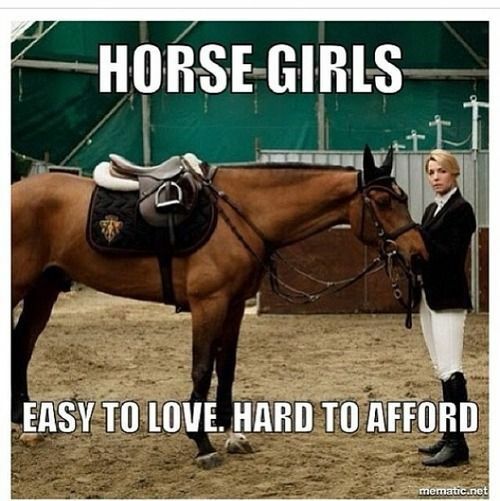 Most of the time, they do not even care what they look like unless they have to find a matching pair of breeches for the new saddle pad they just bought. You rather make sure that whenever you buy horse stuff: MATCHY is the name of the game! 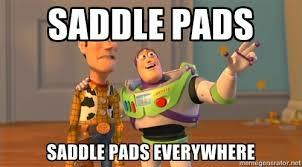 Do not dare to buy a yellow shirt and a yellow saddle pad and think that they are matchy matchy as they are PROBABLY not! You will soon learn about the fine difference between lemon and straw, gold and cream, flax and saffron. You might have thought they look all the same until you met this crazy horse girl that will tell you how wrong you are.